With construction of the Second Avenue subway line expected to finish up in December 2016—fingers crossed!—the eastern part of the Upper East Side is finally upping its public transportation creds, and that likely spells a bump in apartment prices in Yorkville. Is it too late to score a bargain? Broker Ammanda Espinal of Douglas Elliman tells us where the deals are near “The Line that Time Forgot” in this week’s Buy Curious. I'm thinking about buying in Yorkville, especially since the Second Avenue Subway seems like it's finally becoming a reality. Is now the time to buy? Or have I already missed the deals? Where should I be looking and what can I expect to pay for a two-bedroom? The promise of new mass transit service to the corridor of real estate extending from Third Avenue to the East River is a catalyst for dynamic change in Yorkville—a neighborhood that many would-be buyers purposely avoided for decades because it was too far away from transportation. The first phase, scheduled to be completed in December 2016, will extend the Q line along Second Avenue from 96th Street to 63rd Street, where riders will be able to transfer to the F line. The next phase will extend the line to 125th Street and Lexington Avenue, though the timing for that is unclear. Eventually, the plan is for the train to go all the way to the Financial District. More than 13 new buildings have already gone up since construction started in 2007, creating more than 2,500 new apartments, including luxury rentals, and at least three more are in the works, including 1683 Third Avenue, 203 East 92nd Street and 1711 First Avenue. People already want to live in Yorkville, despite the less than ideal subway access. New stores and eateries are also moving in, such as a Whole Foods and restaurants like The Meatball Shop, The Writing Room, Infirmary and The Penrose. And some of the city’s best known private schools—including Dalton, Brearley, and St. David’s School—are expanding or renovating. Once the Second Avenue line is fully operational, the area will only get more desirable, raising apartment prices and rents. Whether you buy a co-op or condo depends on your preference. Co-ops will be more affordable—the median sales price for a two-bedroom co-op in Yorkville, according to Streeteasy, is $1.2 million—but the building's rules may mean you'll reap less of a profit down the road and limit your options for renting it out. The median price for a two-bedroom condo is more, at just over $1.9 million. However, you may prefer a condo for the flexibility to rent out your apartment as an investment—especially if (or when) rents go up. Are all the deals gone? Median prices in Yorkville are rising faster than the rest of Manhattan—about 12 percent since 2008, versus 3 percent across the borough, according to appraiser Jonathan Miller of Miller Samuel, who spoke at a panel discussion on the renaissance of Yorkville held in late April. This is all happening in anticipation of the subway. Of course, there’s no way to predict exactly how much prices will continue to increase, but all signs indicate that they will, especially as new buildings and better stores come to the neighborhood. In short, prices are high, but they'll get even higher. Find the best value near subway stops: Many people might find construction conditions on Second Avenue undesirable to say the least—what with the noise, the dust, and the equipment strewn about. If you’re willing to endure living in a construction zone for another year or two, you could buy something that will be worth a lot more in a few years. Apartments located near the 86th and 96th Street subway stops have the greatest potential for appreciation so you may want to start your search in those areas. Since apartments in both locales are more accessible to the current subway lines, prices are slightly higher there at the moment, and they will only go up with the Second Avenue subway. Go east for views: If you’re wondering if there’s a difference between buying on Second Avenue itself or east of it, know that views of the East River are definitely better from First and York Avenues, and those streets are also closer to Carl Schurz Park. It’s an extra block or two to the train, but could be a worthwhile compromise for the space, views and quiet blocks. It would be difficult to gauge how much you’d save moving further east, but you'll definitely pay less. Upper East Side two-bedroom/two-bathroom condop, $2,167,360: Located near the 94th Street entrance to the subway line, the Azure is located at 333 East 91st Street between First and Second Avenues that has over 6,300 square feet of amenity space. (Espinal is handling the marketing.) The high-floor unit has a glass-enclosed 68-square-foot balcony, 10-foot ceilings, floor-to-ceiling windows and views of the East River. There’s also an open kitchen, a master bedroom with two walk-in closets and in-unit laundry. 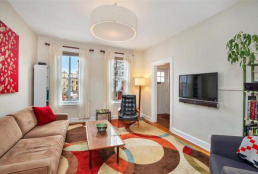 Upper East Side two-bedroom/two-bathroom co-op, $1,200,000: This two-bedroom at 445 East 86th Street between First and York Avenues has a dining area, an updated windowed kitchen, a walk-in closet and views of the East River and RFK Bridge. The pet-friendly co-op offers a live-in super, a 24-hour doorman, a roof deck and a garage. 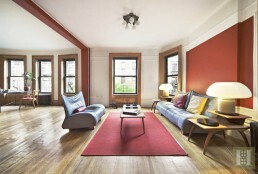 Upper East Side two-bedroom/two-bathroom co-op, $1,995,000: Close to Carl Schurz Park, this renovated pre-war two-bedroom at 520 East 86th Street between York and East End Avenues has a wood-burning fireplace, high ceilings, moldings and patterned hardwood floors. The kitchen has stone countertops, a full pantry area, and a laundry area. The master bedroom has a renovated en suite bathroom with vintage terrazzo floors and the second bedroom has a wall of closets and city views. Upper East Side two-bedroom/2.5-bathroom condo, $2,100,000: This two-bedroom at 170 East End Avenue between East 87th and East 88th Streets has views of Carl Schurz Park and the East River, and offers a split bedroom layout (meaning the master bedroom is separated from the other bedroom by the living room and dining room). The building has a 24-hour concierge and full-time doorman, as well as a fitness center, a children’s playroom, a screening room, a library, a squash court and a golf simulator. Upper East Side two-bedroom/2.5-bathroom condo, $2,450,000: This high-ceilinged corner unit at 305 East 85th Street between First and Second Avenues has a kitchen with a wine cooler and in-unit laundry. 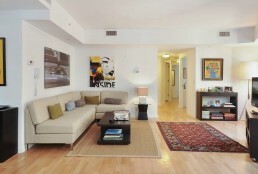 The apartment offers floor-to-ceiling windows and wood floors, and the bathrooms have radiant heat flooring. Amenities in the pet-friendly condo building include a 24-hour concierge, a playroom, a fitness center, a bike room and a roof deck with a children’s play area. Upper East Side two-bedroom/one-bathroom co-op, $749,000: Located near Carl Schurz Park, the East River Promenade and just a block away from a year-round farmer’s market, this sunny 2-bedroom at 525 East 82nd Street between East End and York Avenues has wall-to-wall windows, 9-foot ceilings and crown moldings. A large foyer can be used as a dining area, and the newly renovated chef’s kitchen boasts a variety of stainless steel appliances. The co-op building has a part-time doorman, a live-in super, bike storage and a garage. 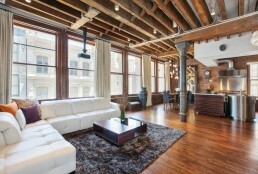 Is this Dumbo two-bedroom worth $4,600 a month, even after a $250 discount?